Boston Baroque's New Year's Day galas have long been among the most enjoyable concert traditions in town; conductor Martin Pearlman (below left) always seems to bring just the right touch to a program that's reliably light, yet musically serious - and often conceals a welcome shot of romantic comedy (everybody gets a little champagne toast at intermission, too). All this was once something of an open secret in classical circles, but since the radio broadcasts of the concerts began last year, it seems the whole world knows. So the 2014 edition was more packed than ever - but I'm not complaining; a little crush in Sanders Theatre isn't much of a price to pay for partying down with Bach on New Year's. It does seem that I've heard a lot of this particular composer this holiday season - only thank goodness, Pearlman didn't try to sneak in anything from the lesser Bachs (like cousin P.D.Q.! 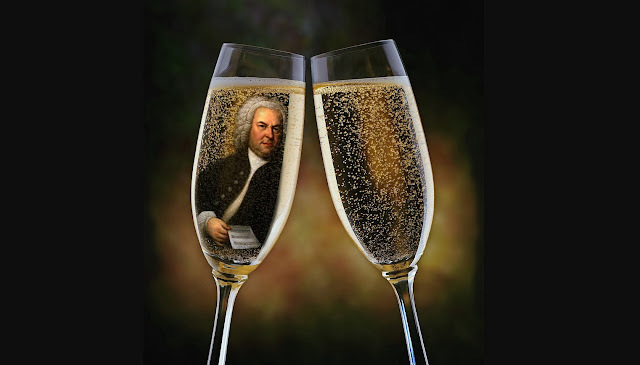 ); Pearlman's program was all Johann Sebastian, the Big Kahuna himself, with a heavy helping of his greatest hits - two Brandenburgs (3&4), along with the lesser-known, but still familiar, "Wedding" and "Coffee" Cantatas. Brandenburg No. 4 came first, with its cascades of recorders bouncing against each other like bubbles in champagne. The opening phrase is among the most famous in the entire Bach canon, but I didn't feel that the ensemble, despite sterling contributions from Aldo Abreu and Christopher Kreuger on recorder, sounded quite as joyous it might have. In fact things didn't seem to come together, oddly, until the plaintive Andante, which proved quite touching. Luckily this coherence continued into the fugue of the concluding Presto, which violinist Christina Day Martinson led with almost feverish energy. Next came the "Wedding Cantata," (Weichet nur, betrübe Schatten, BWV 202), believed to have been penned by Bach for, yes, the nuptials of a friend (although we're not sure who). Here the vocals were essayed by the ripely statuesque soprano Courtney Huffman, who (alas) proved soft in her lower register, so her opening banishment of "melancholy shadows, frost and wind" was somewhat hard to hear (hence, perhaps, the weather of the past week!). Ms. Huffman's voice bloomed, however, in her upper range, and she proved an elegant stylist, calling to Phoebus in a later aria with forcefully rhythmic fire, and sharing a touchingly sweet duet with Marc Schachman's yearning oboe in "Sich üben im lieben." After intermission (and a gulp of champagne, along with a few Hershey's kisses) came Brandenburg No. 3, which featured Pearlman at the harpsichord before what amounted to an all-girl band (but the intriguing popularity of period music among female musicians is a topic for another day!). This time the ensemble was quite cohesive from the start, if perhaps not overly vigorous - but the energy level of the performance steadily built as it progressed. Martinson was again in fine form, but as the melodic line is traded back and forth among the players in this concerto, everyone had a chance to shine (I felt Sarah Darling was a passionate standout). Although it must be mentioned that someone in this crew had a tuning problem - which led to a few sour notes toward the finish. Finally came the oft-mentioned (but less often heard) "Coffee" Cantata (Schweigt stille, plaudit nicht, or "Be still, stop chattering") which I confess proved a slight disappointment. But then - dare I say it - I don't find the cantata itself that interesting, even though I appreciate it's the closest thing to an "opera" that Bach ever wrote, and even though his brilliance glints through some rather impacted structure here and there. Courtney Huffman returned to the stage as a daughter with a taste for coffee who spars with her indignant father, baritone Andrew Garland, over her addiction - and while both were technically assured, both were dramatically a bit flat. Garland fumed but didn't really bluster, while Huffman is such a splendid amazon that it was hard to imagine her kow-towing to Daddy for even as long as it takes to brew a latte (the daughter does get her way in the end, of course). More stage business with narrator/tenor Matthew Anderson might have helped matters, but even as it was, the cantata proved a pleasant-enough diversion. 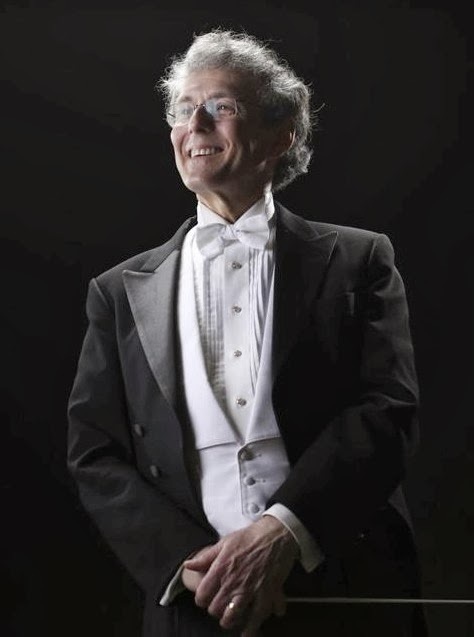 As if perceiving a slight sense of anti-climax in the air, conductor Pearlman then announced from the stage a special treat: a period instrument version of Cole Porter's "Begin the Beguine," sung by Garland. It turned out to be an inspired gambit; "Beguine" proved quite beguiling on harpsichord and gut strings, and the technical finish of Garland's vocals recalled the lost world of operetta, whose singers were often the first to cover the American songbook. The performance delighted the crowd, and recalled to me another similar moment from a year or two back - Kevin Deas' wonderful rendition of "Old Man River," again to period accompaniment. I truly believe there's a commercial idea here - with careful curation, you could put together a smashing album of Broadway classics in this way. I even have a name for the project - "Baroque Martini." Here's hoping it's for sale at the next Boston Baroque New Year's concert!